Tunggalian runs until May 11 at Vinyl on Vinyl Gallery. (SPOT.ph) Despite technological advances, many of our farmers today still rely on carabaos to assist them in their agricultural tasks—from plowing rice fields to transporting and delivering products. It is seen as a symbol of hard work but, ironically, often associated with poverty-stricken masses. 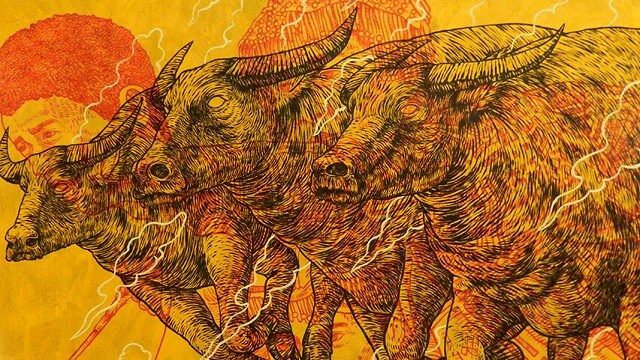 Street artist and painter Archie Oclos uses this image of the carabao to raise concerns on social injustice, land reform, and other national issues in a solo show titled Tunggalian, which runs until May 11 at Vinyl on Vinyl Gallery in Makati. 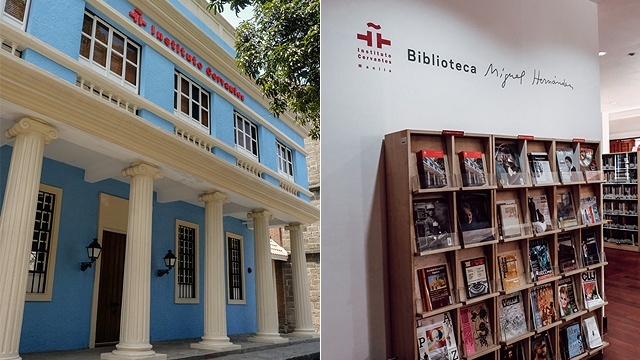 He was just recognized as one of Cultural Center of the Philippines’ 13 Artist Awardees for 2018. Growing up in a family of farmers in Catanduanes, Oclos spent many years watching and observing carabaos—slow-moving yet strong and steadfast. He likened these characteristics to that of farmers, workers, and many who belong to the marginalized sectors of the society. 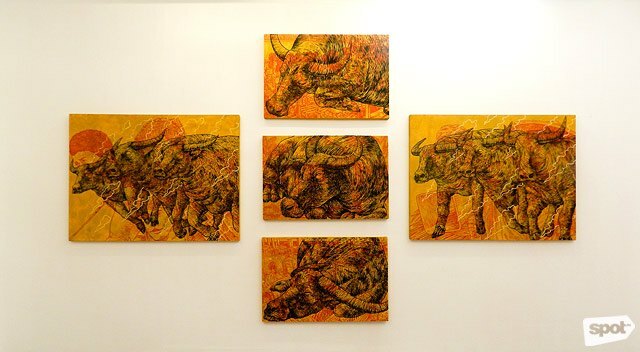 In Tunggalian, Oclos portrays carabaos as feisty and aggressive—qualities that aren’t often attributed to these seemingly friendly animals, yet apt for the name of a collection that when translated to English means conflict or struggle. This isn’t the first time that Oclos used his art as a tool to bring attention to our country’s pressing issues. His works often involve portraits of indigenous peoples, farmers, and workers who often look firm and would always carry a posture that can only be described as regal. On the flip side, Oclos would represent grimness when the subject is someone in power. The artist seeks to engage people through his art in discussing important issues along with how a community can contribute to the causes he has chosen to focus on. 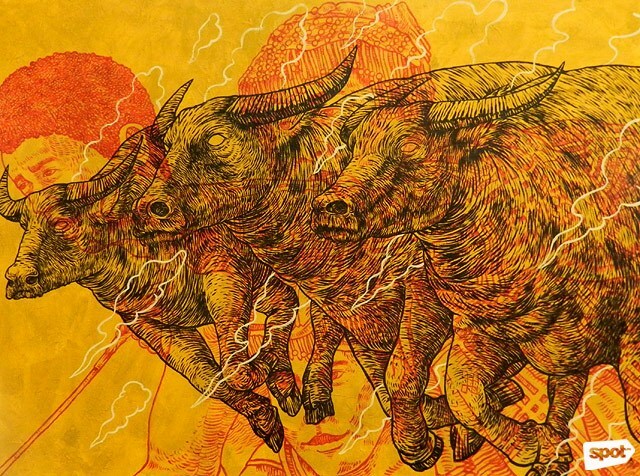 In “Lupang Ninuno, Depensahan at Ipaglaban,” three carabaos are pictured getting ready to attack trucks and other large construction vehicles with their horns. The piece, a commentary on how indigenous lands are exploited through mining and urbanization, is very straightforward and truthful. Even Oclos’ technique in this show supports the content of his works of art. 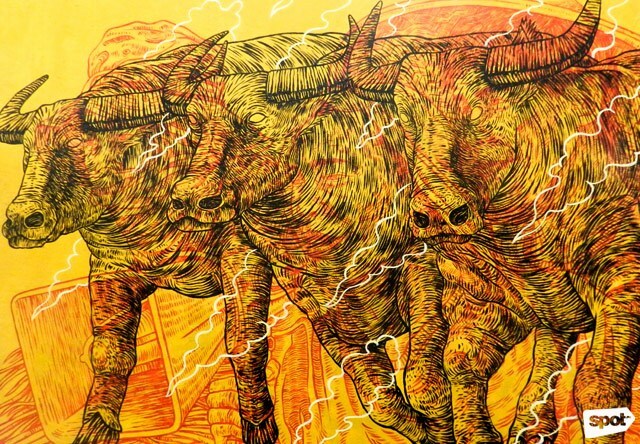 He painted scenarios of the ills of society by using shades of yellow and red acrylic, then painted over them with bold figures of carabaos in black. 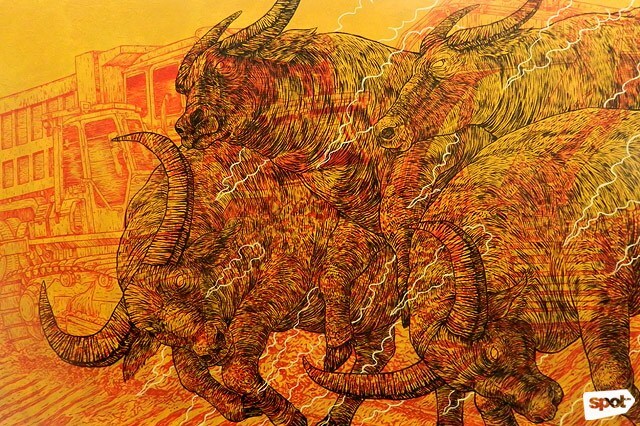 In a way, the composition itself provides a scenario for conflict; subjects lay on top of each other but still emphasize his chosen symbol for strength—the carabao. Oclos’ portrayal of the empowered animal draws parallelism to a tragic yet haunting short story written by the late Deogracias A. Rosario titled Walang Panginoon. In the story, Marcos—an impoverished farmer—thought of ways to stop the abusive landlord from taking their ancestral land. He wakes up at dawn dressed as the landlord to walk the carabao in the fields. Marcos whips the carabao without mercy and waits for the time when the landlord visits their house to take the land. 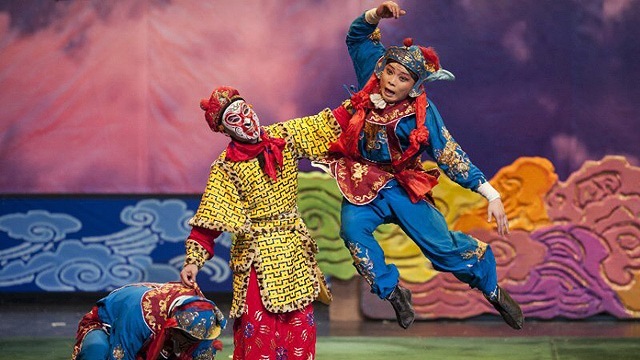 Upon seeing the actual landlord, the carabao immediately attacks, resulting in his death. The story delivers a satisfying poetic justice: An element that can also be found in Oclos’ works where we find depth in the transparent layers of his paintings. This reminds us that poverty has many complexities to it—contrary to what Department of Budget and Management chief Benjamin Diokno said in a press conference: “Kung masipag ka lang, hindi ka magugutom sa Pilipinas,” and to fully understand how to fight it will need more than feeding the poor. Oclos’ works open our eyes to these layers of truth, especially the ones that are hard to swallow because they remind us how we have made the powerful more powerful with our silence and apathy. Tunggalian runs until May 11 at Vinyl on Vinyl Gallery, 2241 Pasillo 18 La Fuerza Compound, Chino Roces Avenue, Makati City. For more information, visit Vinyl on Vinyl’s website.